The Shawnee war chief, Tecumseh, and his brother the Prophet, also known as Tenskatawa, played crucial roles in leading the Indians in the war. By 1811, Tecumseh had built a confederation of more than two dozen Indian nations, all of whom hoped to stop the American settler encroachment on their lands. One might ask why would they be concerned? The answer is clear. Tecumseh and his followers had observed eastern coast and upper Great Lakes Indians being removed from their lands by settler expansion, and they had seen a domino effect as one removed nation encroached on another’s land. The residential order of more than one hundred eastern Indian nations had been permanently disrupted. Furthermore, both the French and Indian War, called the Seven Year’s War in Canada (1756 to 1763) and the American Revolution (1775 to 1783) cost many native nations lives and land. The Indians in Tecumseh’s confederation had every reason to be concerned about the future. It’s important to ask not only about the native leaders methods for dealing with the situation, but also to ask about their decisions, their influences and their vision for future relations with the United States and Britain. Tecumseh is a good case in point, since it was his decision, as a leader, to try to build a strong system of many alliances with other native nations. At the time, each native nation consisted of a few to several communities, each speaking a different language. Tecumseh realized that he had to depend on interpreters to translate his conversations and speeches to each Indian nation that he came into contact with. He also knew that he would have to raise a massive but focused army, drawing from these diverse Indian nations, a daunting task. Imagine trying to get all of Europe, with its different cultures and languages, to fight as a single army. Finally, Tecumseh’s decision to forge an alliance with the British shows him to be a leader wise in the ways of statecraft. The daily challenges of managing an Indian confederation and an alliance with the British would be daunting for any individual. Tecumseh’s and the other Indians’ decision-making process went well beyond politics. He and his fellow leaders knew that the British and American linear minds moved from claiming the land, to colonization and exploitation of natural resources. They knew their own process was one of native logic and inclusiveness -- involving the flora and fauna and native communal values and relationships. Thus, the Indians were acting on a different system than either the U.S. or the British. Choosing the British as an ally was difficult at best, but the future of native North American hung in the balance. Tecumseh preached his confederation and alliance point-of-view to various tribes, arguing that, in the big picture, an Indian confederation held the hope of stopping U.S. westward expansion. He gained respect in almost every case, and many followers, although the Choctaws stood firmly for neutrality. Pushmataha, the noted Choctaw leader, opposed Tecumseh’s grand alliance. In 1811, when Tecumseh was in the South, a group of natives led by Tenskwatawa, attacked U.S. army forces in the Battle of Tippecanoe. 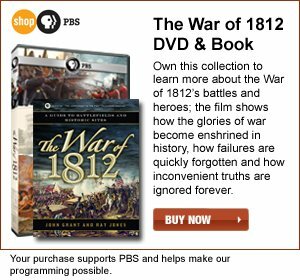 The battle was a draw, but the U.S. General William Henry Harrison declared victory and then had his troops sack and burn Prophetstown, Tecumseh’s home base in the Indiana territory. 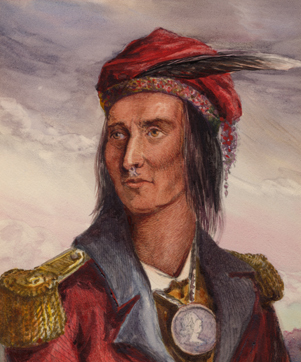 Following the Tippecanoe defeat, Tecumseh realized even more how important it was for a British alliance. During the war, the Indian nations fought more than forty battles and skirmishes against the U.S. In southern Canada, pro-British and pro-U.S. Iroquois found themselves fighting each other, but in most engagements, the native forces fought alongside the British. 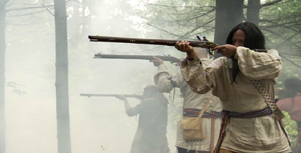 They were key to the British success at both Detroit and Queenston; at the Battle of Beaver dams native warriors, with no help from their British counterparts, defeated the Americans, taking 500 prisoners of war. 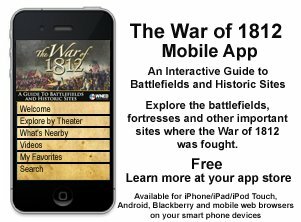 Although the Creek War of 1813-1814 is not normally viewed as a part of the War of 1812, Creek resistance to the U.S. Army in the south led to a series of battles that eventually crushed Indian military power in that region. Perhaps the most significant battle took place in 1813 in Canada. Tecumseh and his warriors, deserted by the British forces, faced a pursuing army of Americans led by William Henry Harrison at the Battle of the Thames. As this confrontation became certain, Tecumseh promised his warriors that there would be no retreat. This battle, he felt, must be won in order to stop American westward expansion in all areas. But Tecumseh was mortally wounded, and his death and defeat marked the end of the native campaign to drive back white settlers. On a larger scale, the American victory cleared the way for the U.S. claim to the native interior of North America with more treaty negotiations following, resulting in numerous removals of most of the eastern woodland Indian communities to the west. After the War of 1812, the U.S. negotiated over two hundred Indian treaties that involved the ceding of Indian lands and 99 of these agreements resulted in the creation of reservations west of the Mississippi River. Other native resistance movements sprang up, including the Black Hawk War of 1832 and the Second Seminole War (1835 to 1842), but neither affected so many different Indian nations as did the War of 1812. Both the war and the treaty that ended it proved to be devastating to all of the eastern Indian nations. The Ghent agreement halted U.S. expansion into Iroquois land in Canada, and some native communities of the Great Lakes managed to remain in their original home areas, but their small numbers posed no threat to the existence or the expansion of the United States. Donald Fixico is the Distinguished Foundation Professor of History at Arizona State University, and the author of Treaties with American Indians: An Encyclopedia of Rights, Conflicts and Sovereignty and Rethinking American Indian History. Some of the Native nations occupying land that the U.S. wanted. Tecumseh by B. J. Lossing after Pierre Le Dru. Re-enactors portraying Tecumseh’s warriors at the Battle of the Thames.